Last weekend I discovered Guestroom Gallery, a nice space just a few blocks from my home at 4114 N Vancouver Ave. I love having a gallery nearby where I can get a quick art fix when needed. I doubt though, the Guestbook's and Quality Picture's artistic program will intersect any time soon: Guestbook's next show, opening November 3, features artwork by Tillamook Cheddar a young and upcoming talent who happens to be a Jack Russell Terrier. 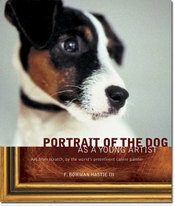 At the opening, "Tillie" will be signing copies of his latest book, Portrait of the Dog as a Young Artist. I'm going just to watch him sign books! Join me!